These are a few of the sketchbook pages I created in the last 2 weeks. 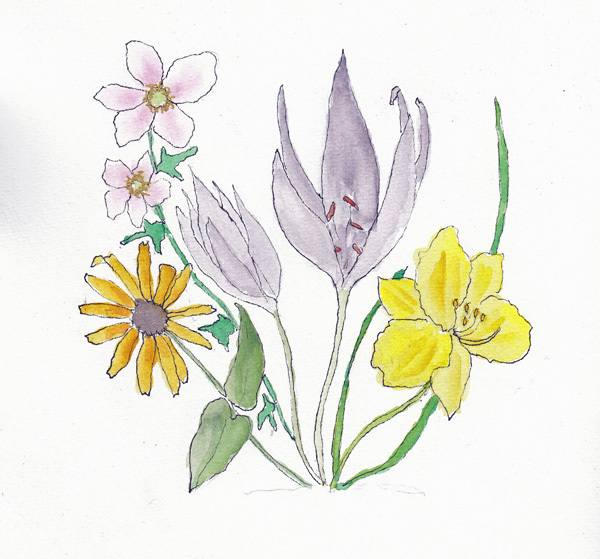 I walk through Wagner Park on my way to Battery Park City Figure Al Fresco, and occasionally draw single flowers. These are a few of the flowers that were in bloom on a single day. I love drawing single flowers and have many sketchbook pages that look like this during the Spring and Summer months. I have no idea what the lavender flowers are. I've never seen flowers that have NO leaves. 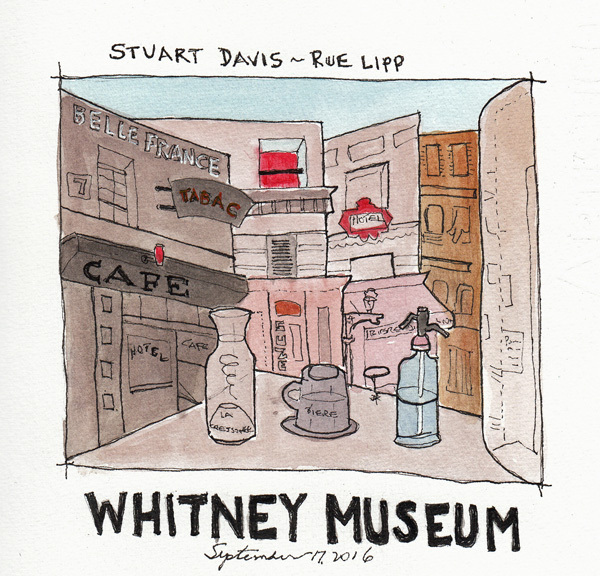 My friend Kathy was visiting from San Antonio and I finally got to see the Stuart Davis exhibit at the Whitney Museum. I love several of his more representational paintings in the exhibit, especially his Manhattan and Paris paintings, and sketched one at the museum and painted it later. 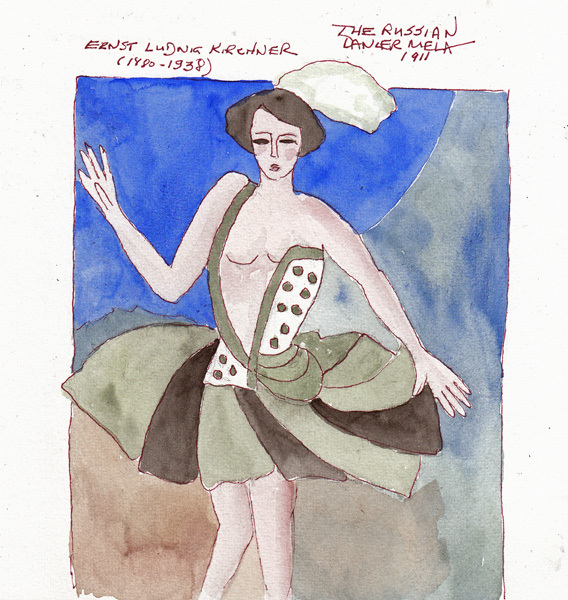 Ernst Ludwig Kirchner is one of my favorite German Expressionist painters. 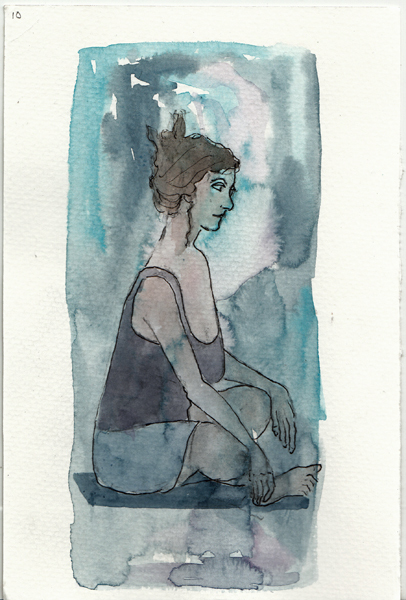 There is a new exhibit at the Neue Galerie and I was inspired to sketch one of his paintings from the permanent collection from the exhibit. Kathy and I spent hours at the 9/11 Museum - 2 days after the bomb blast in Chelsea. We got an emergency text right before we arrived at the 9/11 museum with the name of the bomber and a New York Times Breaking News email while there telling of his capture. It is a very emotional museum visit and another terrorist event in the City made it even more so. 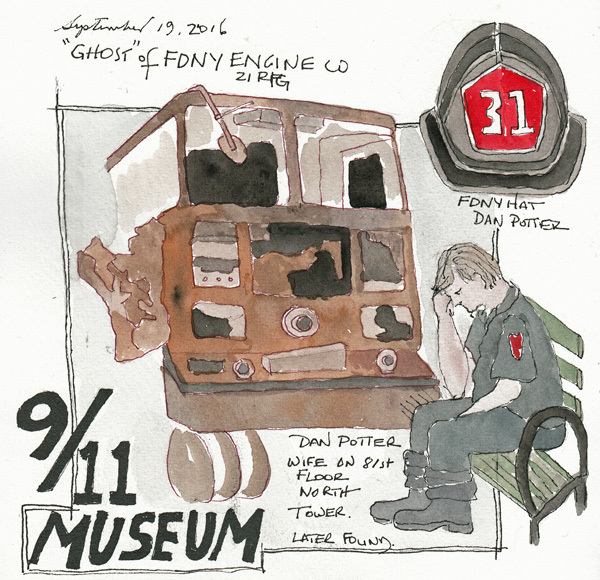 I sketched a badly burned firetruck and then Fireman Dan Potter, from a photo taken while he was sitting thinking about his wife who was on the 81st floor of the North Tower. But she survived! 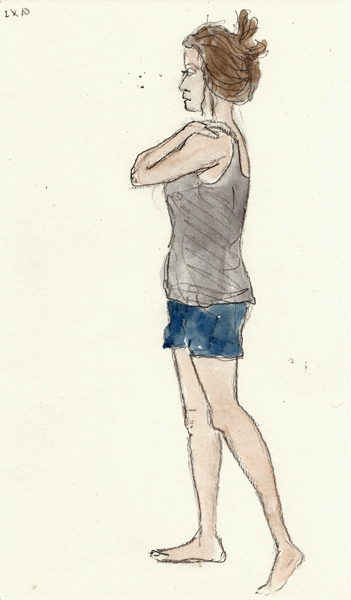 I did some more experimentation at figure drawing this week at Battery Park City. Drawings 1-4 were done with a General Sketch and Wash pencil, with or without added watercolor paint. 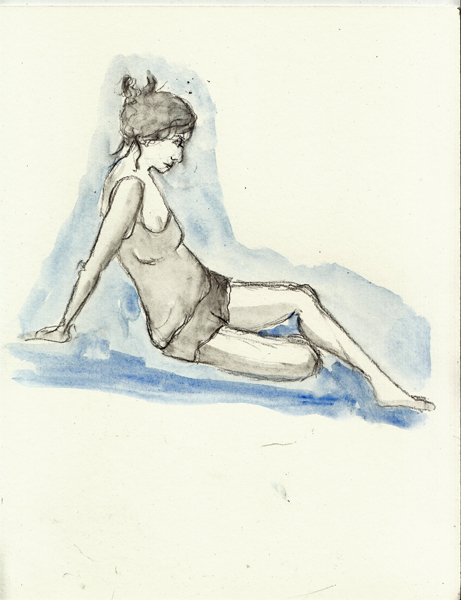 As I draw faster, I have more time to play, even during the shorter poses. Poses 1 and 2 were 5 minutes and 3 and 4 were 10 minutes. Poses 5 and 6 were drawn with an 8B graphite pencil, and then ink. The backgrounds were prepainted wet-in-wet watercolor paintings and then more watercolor was added near the end of the 10 minute pose. I am currently taking Liz Steel's "Seeing Now Buildings" course online. Next to drawing figures, buildings are my second love. 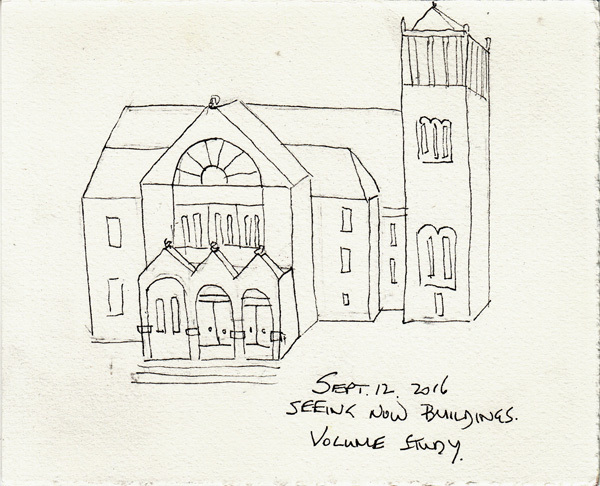 I've drawn buildings while sitting next to Liz on several of her visits to NYC. 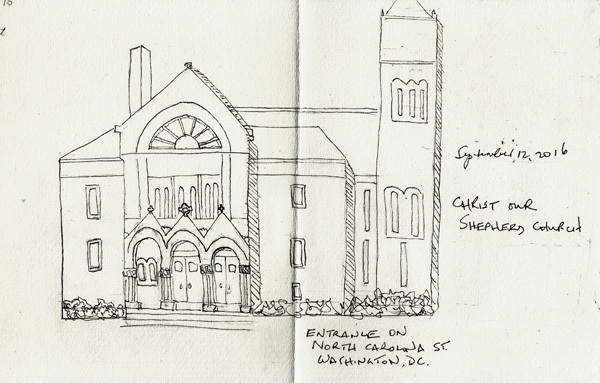 Her ability to "see" the structure of a building and draw it quickly is astounding. I was in Washington DC when I read through Lesson 1 and did my homework. 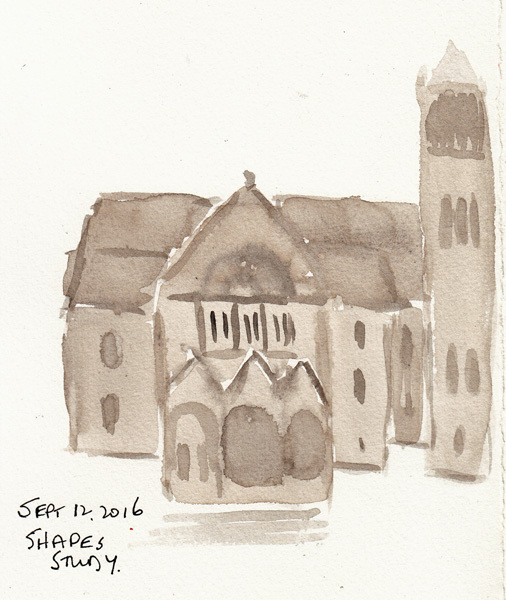 I chose a church that was only several blocks from my son's house and it was a challenge. My first sketch, drawing the edges, later became my final sketch. And I didn't have time to paint it on site and may keep it as a pen and ink sketch. The second part of the Homework was to understand the building a little more by painting the shapes - including the negative shapes of the windows and doors and some shadow shapes. 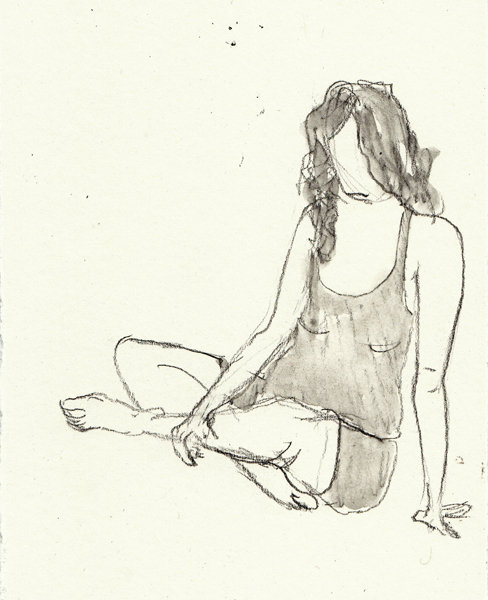 Liz said that this is great preparation for drawing looser - something I would like to learn to do. The 3rd part of our homework was to draw the volumes - based on the geometric shapes. This was definitely the most challenging part and I had to walk around the building for a better understanding. I had a much better understanding of the building after drawing edges, painting shapes, and determining the volumes. It will be fun to draw it again during another visit - preferably at a time when the leaves which covered so much of the building have fallen. I was very limited in my ability to see it from a distance, or in a photo. I returned to Wednesday afternoon Figure al Fresco after our week in Washington DC. 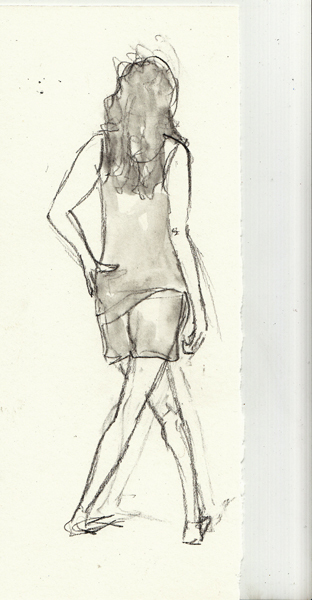 Julie Pierce, a friend of my friend Eunice, was visiting as a guest from the Sydney Australia Urban Sketchers group. 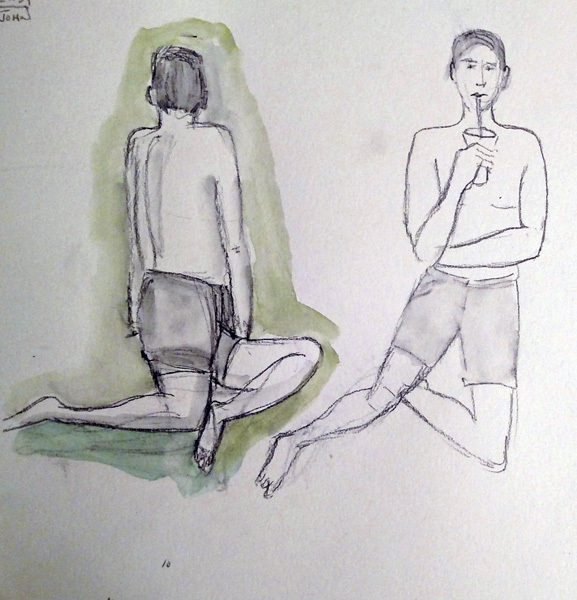 These two 5 minute sketches were drawn with a General Sketch and Wash pencil and shaded with a waterbrush and then watercolor. 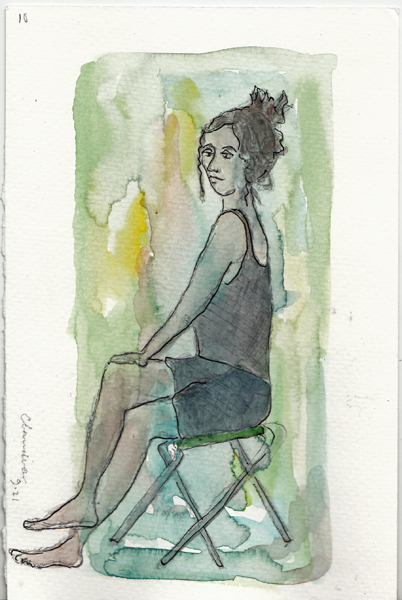 The rest of my sketches (10-20 minutes) were drawn on prepainted watercolor paper - with leftover acrylic paint from my palette in my FIT art class. 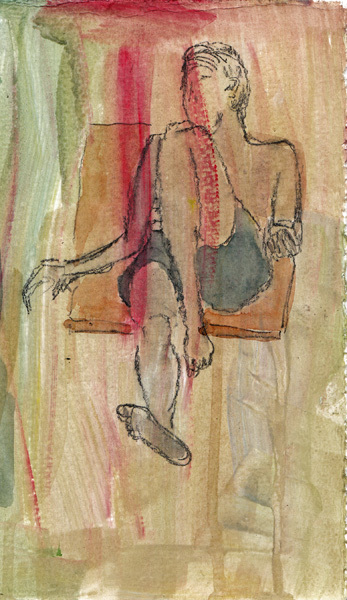 It was fun seeing the drawing emerge from among the many colors and brushstrokes. 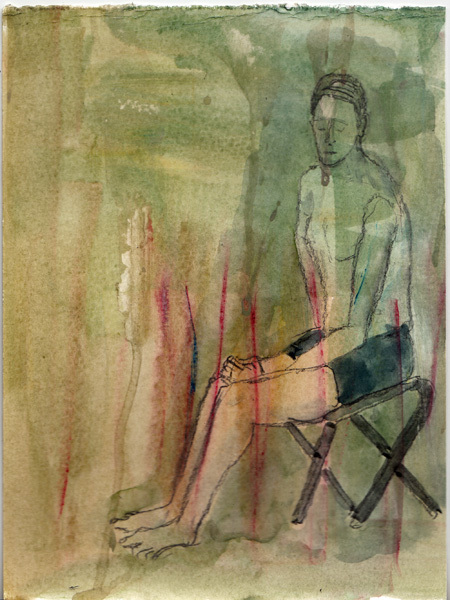 This outdoor figure drawing group meets weekly on Wednesdays, weather permitting through the month of October. It is sponsored and funded by the Battery Park City Conservancy as one of their adult programs. 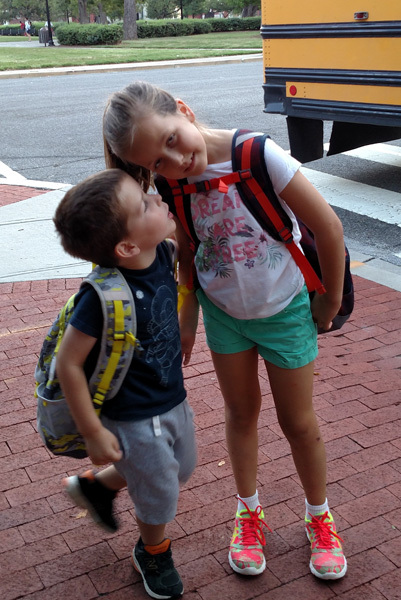 For the last week we were in Washington DC helping to take care of two of our grandchildren. 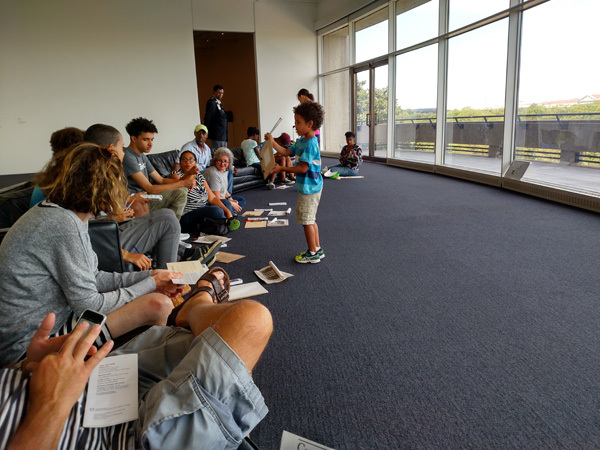 While they were in school on Friday we visited the Hirshhorn Museum (one of the Smithsoniam Museums on the Mall) and looked at their permanent collection for the first time in decades. 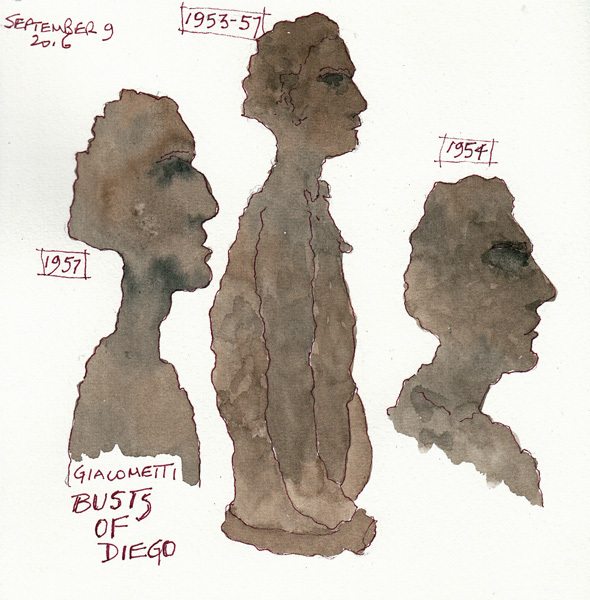 I loved the Gallery that was full of DeKooning paintings and Giacometti sculptures and spent a few minutes sketching several pieces in my watercolor sketchbook. And this is one of my Favorite Dog Sculptures. 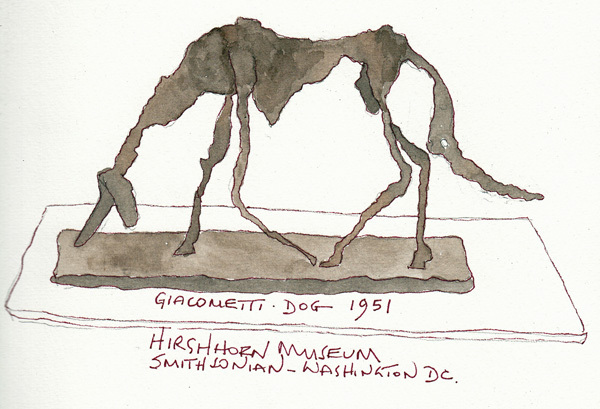 I've seen it in other museums, and finally took time to sketch it. The painting was done later at home. 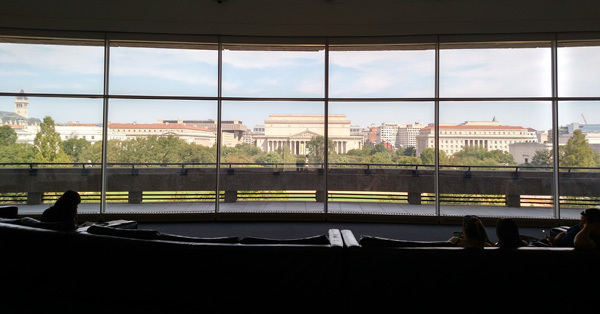 Midway around the circular gallery space there is a gorgeous room which overlooks the Mall, showing the other museums and the National Archives. When I returned to pick up my husband, who was sitting in this room doing a crossword puzzle, I found an art class setting up to draw and paint the rooftops across the Mall. They were interested and very well behaved! 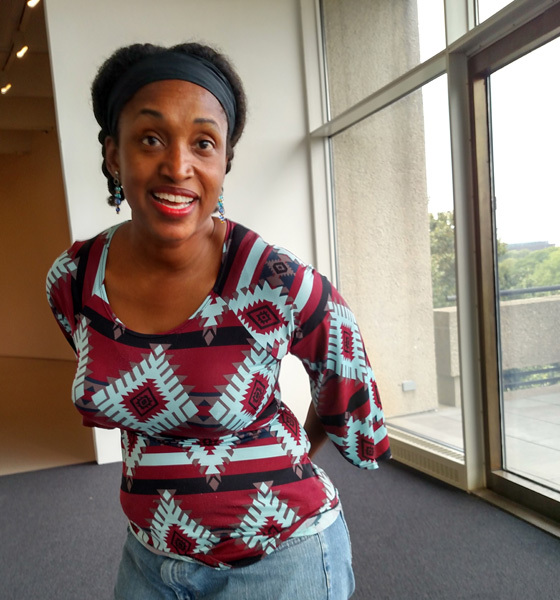 I spent time talking to the Art Smart Lady, Lorina Harris, and was inspired to also draw one of the museum rooftops before we left. 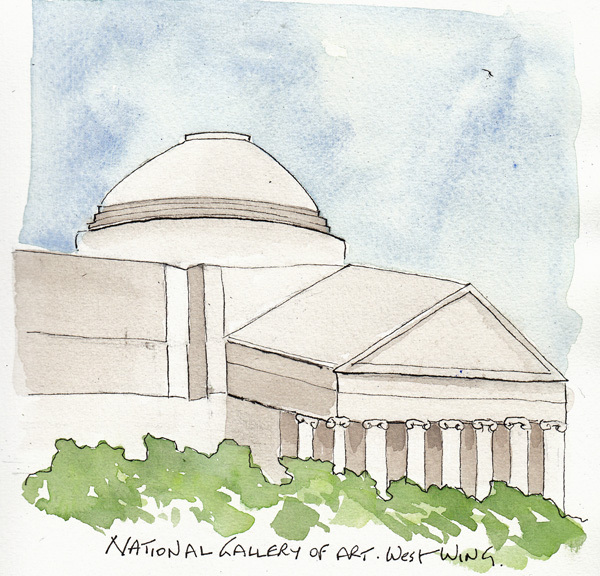 This is the West Wing of the National Gallery of Art.